Topping the original Hemotropin would serve as no easy task with a combination of a powerful ZMA complex, an efficient blend of growth hormone boosting herbs, amino acids and vitamins but Nutrabolics has found a way – and wait until you see what they have in store. First let’s introduce the well known supplement ZMA. ZMA is a combination of zinc, magnesium and vitamin B6. When taken together these minerals will help restore and increase free testosterone production and absorption by up to 30%; a huge plus for the average gym rat or serious athlete. They also double as a calming agent allowing for a smooth transition between sleep cycles which of course aids in rest and recovery in preparation for the next days strenuous training. Our growth hormone is also highly produced during sleep so getting plenty of quality rest is very important to releasing and utilization of this important hormone. Unlike illegal anabolic steroids ZMA does not synthetically or artificially increase hormones but rather it allows our body to use the hormones we have more efficiently making it safe for men and women alike. 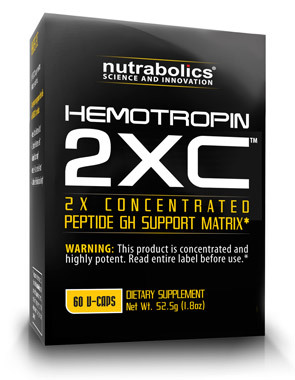 At first glance the consumer might notice that the ZMA count in Hemotropin 2XC is actually less than that of the original Hemotropin and this is true but worry not, Nutrabolics has another trick up their sleeves. You’ll notice the fancy looking word “AstraGin” in the ingredients list and this is where they have really hit a home run. AstraGin is a combination of Panax Notoginseng and Astragalus Membranaceous and increases amino acid absorption by up to 66% and vitamin and mineral absorption by up to 50%. What does this mean? It means you need a lot less of the goods to do a lot more. AtraGin doesn’t stop there, however. It is also “insulin mimetic” meaning it increases glycogen uptake in muscles for up to 24 hours. More glycogen in our muscles means more growth and recovery and less glucose stored as fat. AstraGin also increases insulin sensitivity which further aids in the above mentioned process. The next blend we see is the “Growth Hormone Releasing Peptide Hexamino” which essentially is a well thought out way to say “growth hormone, mood enhancing and sleep inducing amino acid blend” – quite a mouthful; let’s stick to the official version. Some of the amino acids you see in this blend include L-Tryptophan and D-Tryptophan and in case you’re not familiar these are the amino acids found in turkey that has you sleeping shortly after a big holiday dinner. The Tryptophan family has a calming effect by converting to 5-HTP then serotonin in our bodies. Serotonin is the hormone responsible for calmness and positive moods. The effects of serotonin release can be experienced for up to 24 hours helping you get up on the right side of the bed. D- Phenylalanine also helps produce this calming effect which you see in the ingredients list. The other amino acids here including L-alanine and L-lysine have both contributed to huge growth hormone boosts of up to 400% with proper supplementation and synergistic relationships. The presence of L-histidine in this mix helps slow the process of becoming tolerant to the various aspects removing the need to cycle this supplement as a whole. The “Rapid Eye Movement (REM) Maximizing Matrix” could easily be confused with something you’d hear in a modern day sci-fi movie and rightfully so. The most significant component in this matrix is gamma aminobutyric acid or GABA. GABA is the main inhibitory neurotransmitter of the central nervous system (CNS) and also helps produce a calming affecting assisting in not only getting to sleep in the first place but also sleep quality by slowing the CNS activity allowing for a calm, relaxing experience. What makes GABA such a superhero in Hemotropin 2XC is not just its effect on sleep quality but also its ability to boost growth hormone – by up to 200%. GABA alone is one of the most effective supplements to naturally product growth hormone and when combined with all of the above ingredients and the remainder of the REM Maximizing Matrix we experience an intense efficient anabolic process allowing our bodies to capitalize on every natural ability to produce a well oiled machine using up as much of our natural growth hormone, free testosterone and glycogen uptake as possible in a safe manner. Hemotropin 2XC can work synergistically with Hemotest 2XC to produce an intense hormonal output boosting both testosterone and growth hormone even further while also becoming a highly effective nutrient transport system. If your goals include building lean muscle, melting fat and doing your best to become superhuman then make sure your day doesn’t start or end without these products.